Anpex 1970 18ct Gold Stamps. NSW 1d Sydney View and Australia 1913 £2 Kangaroo 18ct Gold Stamp limited edition Replicas, each with Anpex 1970 on reverse, in special case with certificate. Weighs 0.64oz Troy with a 75% Gold content. Victoria 1d Half Length and Queensland 1d Chalons Head 18ct Gold Stamp limited edition Replicas, similar to Anpex 1970 replica set, in special case with certificate. Weighs 0.64oz Troy with a 75% Gold content. 1984 framed print of a pair of Rosellas by D. Lindsley De-Gray. Framed size 66cm x 56cm. Attractive. Mammals of Australia by Krefft, the 1979 Facsimile edition published by Lansdowne Editions. A limited edition of 350 copies. Readers Digest Complete Book of Australian Birds, 1977 Edition, in excellent condition. The Mammals of Australia by John Gould 3 volume 1976 reproductions published by Macmillan in excellent condition. Only the Kangaroos volume has a slipcase. Range of mainly Burnside Council related items including 1936-37 Annual Report, various papers, minutes and invitations mostly from 1947-51 and 1956 Burnside Council Centenary meeting agenda. Also 1924 Probationary Students agreement. Range of collectable items including antique "The Consol" pocket watch in working condition, Tacy Watch Co "Admiral" pocket watch [U.S.A. PAT. MAY. 24. 1904] not working, without glass and missing the seconds hand, 1937 Coronation Pocket Knife, "The Wren" Ludwig [Germany] miniature mouth organ, Australian Commonwealth Military Forces badges (3) and small range of mainly Australian Pre-Decimal copper and silver coins. Set of 4 "Perfection" spoons in original box, each with a small reproduction of a different commemorative Florin at the end of the handle. Also 2 Gold plated brooches produced from mounted Halfpennies that have been punched into a curved shape. 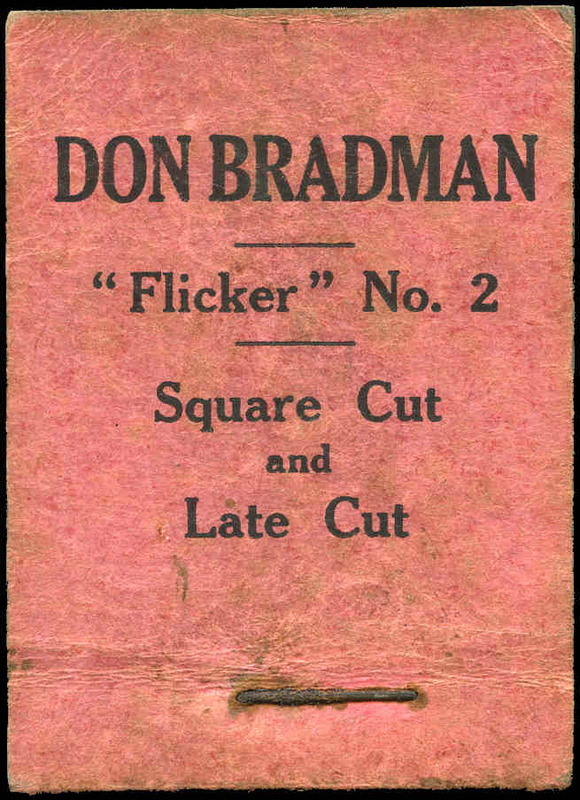 c1930 Don Bradman "Flicker" No 2, Square Cut and Late Cut. Flicker books contain a series of photographs which, when flicked through, create the illusion of movement. Usual rusty staple, otherwise fine condition. 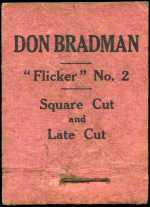 Very scarce and desirable piece of cricket memorabilia. Complete set of McDonalds Cricket Posters from 1982/83 to 1986/87 folded into quarters. Also Australian Cricket 1987 Official Calendar. The Collector's Encyclopedia of Dolls Volume Two, the standard reference work by Dorothy, Elizabeth and Evelyn Coleman in good condition. The most recent edition published in 1986. Also 11 other books or publications dealing with dolls or doll houses. Collection of over 3,000 Drink Coasters in 11 albums. Accumulation of Ephemera and miscellaneous items including Exhibition souvenir books, Christmas cards, Stereoscopic slides, Trade and Cigarette cards and Postcard books. Noted 1909 Grand Colonial Exhibition souvenir handbook containing attractive Union-Castle Line to South & East Africa advertising card and Japanese set of 11 early hand coloured Letter paper of Celebrated Views and Beautifull Woman, plus 14 matching envelopes. Mainly circa 1940's. 1941-44 Selection of 10 different WWII German propaganda posters, authorised by N.S.D.A.P. Munich. 3 with minor edge faults and one slightly cut down. 24cm x 35cm. 1940's H.E.C. Robinson's Invasion Map of part of Europe and 1957 National Geographic Society map of Europe in very good condition. Also antique Helvetia silver pocket watch in working condition, but missing glass and one hand, plus small range of badges and miscellaneous items. Collection of 300 different early Japanese matchbox labels including many attractive advertising labels stuck on album pages. Accumulation of many hundreds of promotional match folders plus some matchboxes and labels in carton. Also on and off paper accumulation of Australian and Foreign stamps in shoebox. 1939-1945 War Medal, 1939-1945 Australia Service Medal and The Pacific Star medal all with ribbons to "P.A. 4501. J.W. Honey." in original box with 4½d Naval Medal Section wrapper and correspondence. The Pacific Star medal is not engraved. Fine condition. 1899-1902 Queen's South Africa Medal with TV, SAO1 and SAO2 clasps and ribbon to "23343 PTE H. Hayes. 26th COY IMP: YEO:" of the 3rd NSW Imperial Bushman contingent. Fine condition. 1939-1945 War Medal, 1939-1945 Australia Service Medal and The Pacific Star medal (2) all with ribbons to "VX50660. H.W. Honey. D". Fine condition. Also group of 3 miniature reproduction medals by K.G. Luke, Melbourne. Two framed photographs of a high ranking German Officer on a miltary horse, one showing numerous troops on parade. Collection of 132 old photographs circa 1870's, formed by prominent South Australian congregational minister, social and political commentator and reformer who was pivotol in the forming of the University of Adelaide as well as an early proponent of Federation in attractive and ornate album. The album includes a range of prominent early South Australian's including Governor Sir R. Graves MacDonnell 1855-62 and Governor Sir Anthony Musgrave 1873-77 with portraits by a wide range of early photographers. Wonderful social history. Pearl Necklet of 54 6.5-10.5mm semi baroque pearls of white colouration and good lustre. 47cm long strand of unknotted pearls with gold plated circle patterned clasp with an 8mm half pearl bezel setting. Pearl Necklet of 54 6-9mm semi baroque pearls of white colouration and good lustre. 43cm long strand of unknotted pearls with gold plated circle patterned clasp with an 8mm half pearl bezel setting. Selection of 39 45 R.P.M. and 31 LP records with music ranging from the late 1950's to the 1970's, featuring many different artists including 5 Elvis Presley 45's. Some covers a little worn and few 45's without covers. Selection of 14 Edison Diamond Disc Re-Creations (records) with sleeves circa early 1920's. Similar but thicker than 78rpm records. Condition varies from poor to fine. 1873-74 The Weekly Times (Aust) Masks and Faces caricatures featuring No 5. A Popular Preacher. "Charity Covereth a Multitude of Sins", No 10. An Irish Patriot. "Why is Ireland Poor? I'm not! ", No 21. A Commissioner of Customs. "Faithful to Francis", No 24. A Premier. "The New Man", No 32. A Country Member. "Eureka!" and No 32. A Police Magistrate. in fine condition. Odd minor fault. Selection of 38 different tobacco tins from Great Britain including Winfred, High Card, Sweat Crop, Copes Royal Club, Peal O' Bells, Kenilworth Old Mill Curly Cut, State Express 777 and many more. Circa mainly 1940's and 1950's. Varied condition. Selection of 53 different old Australian Tobacco tins including Dammans, Perfection, Rolliown, Private Seal, White Oak, Desert Gold, Old Gold, Cornell, Lucky Hit, Temple Bar, Three Castles and many more. Condition varies. Selection of 25 mainly old Australian Tobacco tins including Dudgeon and Arnell Happy Thoughts, B.D.V., Wills Capstan Cut Flake, Temple Bar (4), Town Talk (3), Lucky Hit, Wills Capstan Oval Cigarettes, Lambert and Butler "Waverley" cigarettes and more. Condition varies poor to fine. 1893 Wisden's Crickerters' Almanac hardback edition without dust cover. Originally softback edition, which has been rebound. Minor foxing, otherwise fine condition. 1913 Wisden's Crickerters' Almanac hardback edition without dust cover. Originally softback edition, which has been rebound. Minor foxing, otherwise fine condition. 1917 Wisden's Crickerters' Almanac hardback edition without dust cover. Originally softback edition, which has been rebound. Minor foxing, otherwise fine condition.